Meezan new ad is covering mother’s day and value of mother in the home both at the same time. The ad has been beautifully designed, in which mother of the home is shown preparing iftar for the family while the family members are busy in their work or watching Tv. The turning point of ad start when the mother takes a namaz break and fell asleep while praying. The children stayed away from waking her up and prepared the iftar with the help of father and also internet. 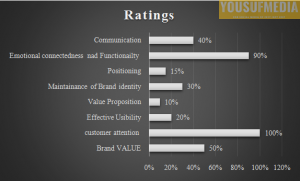 The ads have been successful in developing a new trend in the market developing emotional connectivity with the brand along with strong brand positioning and brand recall. The slogan “Har cheez meezan mai achi lgti hai” offerdual meaning to the customer. First, itportrays the brand name and describes that every food tastes good in meezan, while on the other hand the second meaning describes the balance of life and portrays the family balance. Though Meezan has been successful in developing awareness and emotional connectivity which lead to strong brand recognition and brand recall, yet it failed to offer the customer a distinct value proposition, a reason why the customer should buy Meezan rather than Dalda or Cannolive. Yet it remains successful in keeping the customer intact until the end of the ad and also catering the season presence for Ramzan but failed to develop strong market positioning and value proposition.